Thank you for helping us spread the light of kindness in our families, schools, communities and world! I want to receive the light! I want to share the light! For all gifts of $100 of more, SPARK Kindness will send you or your special friend or family member a beautiful 4oz, handmade, soy candle from Prosperity Candle, a local social enterprise that supports women refugees and artisans through the work of candle-making. If you wish to share the light by making a gift in honor or memory of another individual, please provide a name and mailing address below. If you wish to receive the light, a Prosperity Candle will be shipped to your mailing address. 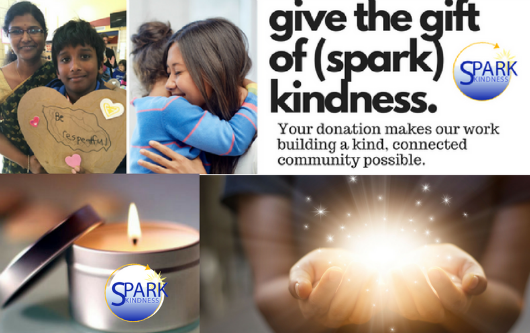 SPARK Kindness is a 501(c)(3) and your donation is tax deductible as permitted by law. We appreciate your support and encourage you to make a secure online donation below. Thank you! $5,000 - SPARK Platinum Supporter - A major investment in SPARK's sustainability. $2,500 - SPARK Gold Supporter - A major investment in SPARK's programming costs. $1,000 - SPARK Silver Supporter – Supports the cost of developing resources and curriculum to help individuals, organizations, and communities anywhere who want to build a more connected, kind and inclusive community wherever they live. $500 - SPARK Bronze Supporter - Covers cost of meals and childcare for a SPARK small group workshop. $250 - SPARK Community Supporter - Covers cost of printed resources distributed at a SPARK program. $50 - SPARK Individual Supporter - Covers the cost of one parent/caregiver attending a year of SPARK programs. $25 - SPARK Friend - Every donation makes a difference! For gifts of $100 or more, SPARK Kindness will send you a special Prosperity Candle! Please mail a Prosperity Candle to me! Please mail a Prosperity Candle to the individual I have dedicated my gift to! It is the power of volunteers that make the work of SPARK Kindness possible. Let us know if you'd like to learn more about joining the SPARK Team! Yes! I'm interested learning more about volunteering for SPARK. Please contact me. Matching gifts are a great way to increase the impact of your donation. Check to see if your employer will match your gift to SPARK Kindness! Yes, my employer will match my gift! Please contact me for details.